Lowdown: 23rd century humanity can only be saved through a weird but good looking girl. Let the record show that I never really liked The Fifth Element no matter how much praise French director Luc Besson gained by it. I saw it at Tel Aviv’s Lev cinema upon its 1997 theatrical release and I was very disappointed by that cinema’s poor presentation but also by the film’s lack of substance. Since then I’ve seen it here and there, never able to have it ignite my flame. Technically speaking, various DVD incarnations of The Fifth Element have been promoted by Widescreen Review (currently celebrating its 150th issue) for their reference material qualities, especially in the picture department. That notion seemed to have passed over to at least one version of the film’s Blu-rays, which is why I did not mind giving The Fifth Element another go. 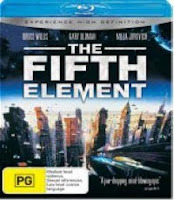 The Fifth Element takes place in a Blade Runner like world with aliens added on top. Some force of evil is unleashed on earth, as it does every 5000 years, and the only thing that could stop it is this mythical being – the fifth element – performing a certain ritual inside an Egyptian pyramid. Why? Don’t ask. Anyway, that fifth element is intercepted by baddies controlled by an evil dude called Zorg (Garry Oldman); you know Zorg is evil because of his American southern accent. Revived by human scientists, the fifth element takes the shape of an orange haired chick (Milla Jovovich). Pursued by evil forces, our orange girl’s only hope is with the talents of Korben Dallas (Bruce Willis), an ex commando turned New York cab driver overflowing with cynicism. On their way to salvation the couple have lots of adventures, both on earth and way over yonder. Let’s face it: The Fifth Element is entertaining to watch and nice on the eyes, but depth wise it is as shallow as Sarah Palin. Sure, there are hints here and there regarding the devastation humans are causing the world through their indifference, but these are very minor; all in all, The Fifth Element is a space adventure, no more and no less. A pretty silly space adventure with some action and some nice moments, but nothing to merit the mythological status some have pinned it with. Best scene: The New York flying taxi scenes are the film’s most entertaining ones, even if the concept was heavily borrowed from Blade Runner. Technical assessment: There can be no arguing about the presentation on this Blu-ray. It is hard to recall a film with such color fidelity. The picture is pretty detailed, too, although it does show some signs of age we are exempted from with newer releases (this could also depend on the version of the Blu-ray at hand). The sound is good, too, although not on par with the latest blockbuster when it comes to shaking the roof off. Overall: Silly fun does not make a film great. 3 out of 5 stars, and that includes extended generosity towards the exemplary reference quality picture.